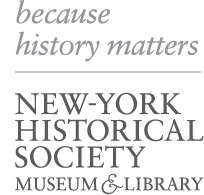 The New-York Historical Society comes to you! Curator-trained docents will visit your institution to provide a 45-60 minute lecture on a variety of NYC topics. All lectures are accompanied by a PowerPoint presentation. Call (212) 873-3400, x352 or email Group.Tours@nyhistory.org for more information. Before they could even vote, women across the spectrum of race and class exercised power and brought about change. Dive into this rich history at our exclusive off-site lecture! Attendees will explore the stories of prominent and little-known women activists of the Early Republic, the abolitionist movement, the 1848 Seneca Falls Convention, and the suffrage movement, as well as learn about our Center for Women's History. This captivating story—explored in the New-York Historical Society’s recent exhibition​​ The First Jewish Americans: Freedom and Culture in the New World—is now told in an exclusive Off-Site Lecture, available for a limited time to organizations in the New York area​.​ Images featured in this presentation include archival documents, maps, ritual objects, rare portraits, and the 16th-century diary—lost for 80 years—of a Mexican Jew persecuted for his faith. The New-York Historical Society’s vast holdings include 474 of John James Audubon’s avian watercolors, including all 435 that were used as models for The Birds of America. A true national treasure, these paintings convey Audubon’s devotion to detail and his desire to capture America’s quickly disappearing wilderness. A Haitian-born Frenchman, Audubon immigrated to America and was soon intoxicated with his newly adopted country. He crisscrossed the then-young nation as an explorer, naturalist, and self-trained artist - a true pioneer and entrepreneur. Learn about his decades long quest to document America’s birds and his monumental struggle to have his work published. This lecture tells the exciting story of the watercolors, the birds, Audubon, and the unprecedented achievement in printmaking that resulted in Robert Havell Jr.’s prints so beautifully contained in the “Double Elephant Folio”. On February 27, 1860, Abraham Lincoln took the stage at Cooper Union and delivered a speech before a crowd of 1,500 people. This speech, now often hidden in the shadows of the Gettysburg Address and the Second Inaugural, catapulted Lincoln onto the national stage and helped propel him to the White House just one year later. Learn why New York was instrumental in creating and sustaining the evolving image of Lincoln as a partisan politician, statesman, wartime commander-in-chief, emancipator, and ultimately, as a martyr to union and liberty. In addition to the Cooper Union speech, this lecture will explore New York’s influence on the Civil War, the impact of emancipation, and the promotion of Lincoln’s persona as he evolved from an obscure Illinois politician to a national icon. Founded in 1804, the New-York Historical Society is the city’s oldest museum. Our holdings cover four centuries of American history and comprise one of the world’s greatest collections of historical artifacts, American art, and other materials documenting the history of the United States as seen through New York City and State. Hear the stories behind some of our most treasured historical pieces including: the camp bed that George Washington slept on at Valley Forge, one of the Civil War draft wheels that led to the worst riot in American history, and the silver Tiffany & Co. controller handle that was used on the maiden voyage of the NYC subway in 1903. You’ll also learn about some of our more than 1.6 million works of art including Hudson River School paintings by Thomas Cole and Frederic E. Church; a vast range of American portraits, including paintings by Rembrandt Peale and Gilbert Stuart; and all 435 of John James Audubon’s preparatory watercolors for The Birds of America. Opened on May 24, 1883, the Brooklyn Bridge was hailed as “the eighth wonder of the world.” Well over a century later it still stands as one of the world’s most recognizable spans. An engineering feat for the ages, the Brooklyn Bridge was the first steel cable suspension bridge and longest suspension bridge in the world. This lecture explores the amazing history of the bridge’s construction and the heroic and sometimes tragic stories of the men and women who made it possible. Discover how the bridge’s construction helped lead to the consolidation of New York and how old world engineering know-how and modern industrial innovation came together to complete the project. You’ll never view the Brooklyn Bridge in the same way! New Yorkers did not suffer the devastation experienced by citizens of London, Moscow, Berlin or Tokyo, but NYC was one of WWII’s epicenters. The city was not only affected by the war, it contributed disproportionately to the final victory. More than three million troops and over sixty-three million tons of supplies passed through New York Harbor en route to the battlefield. Supplying our men and women in the service, New York produced everything from battleships to brassieres and periscopes to penicillin. Hear little known stories such as how a group of German saboteurs landed on Long Island only to take the LIRR in the wrong direction, and why a portion of the FDR Drive is built atop rubble from Bristol, England. Rationing, U-boats, the creation of the atomic bomb, and servicemen spending their last days “On the Town” will all be explored in this lecture.